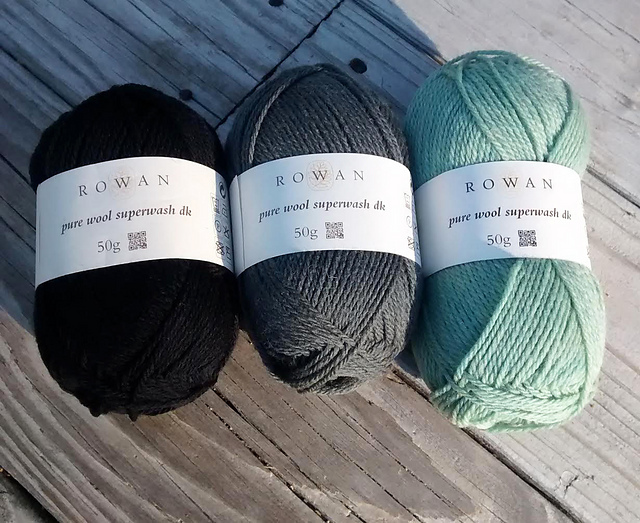 Back in November, when Rowan announced it would be having a garment KAL, I gave a sigh of relief. I needed a break from endlessly modular home decor! 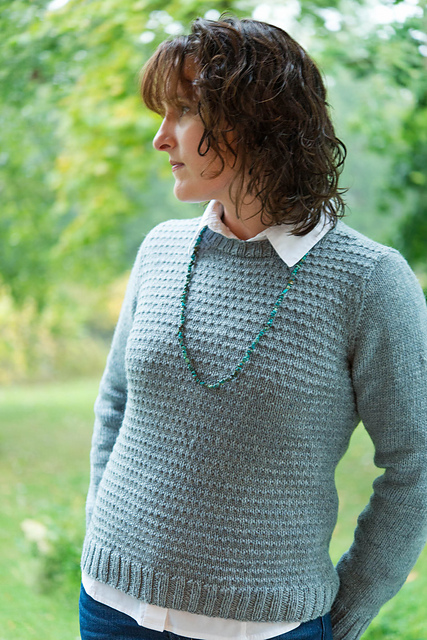 The Rowan Options KAL was designed by Amy Herzog -- you probably recognize her name from the Custom Fit program she developed. For that, you key in your measurements and you get a pattern shaped the way you want, based on a swatch gauge of any sort. I decided on the striped cardigan, so I could play with the color palette of the new Rowan yarn Pure Wool Superwash DK. Wait -- did you just feel some déjà vu? Yes, this is the new DK weight version of the Pure Wool Superwash Worsted from last year's blanket KALs. Also note for those of you confused -- the word "superwash" has been added to both names, but it's still the same yarn. My palette was Black, Steel and a tonal blue-green called Marl. Man, I love Marl! The yarn is very similar to the Pure Wool Worsted -- not too scratchy, but not incredibly soft. It pills a bit, about what you'd expect from the way it is spun. I did find the black to be really hairy though -- you might be able to see it on my close-up photos. Little grey/white hairs. To pick a size, I first tried to get the gauge -- but no matter how I tried, I got 21 stitches instead of 23. Because Amy recommended 2" of positive ease, I thought the 35.5" size would work. 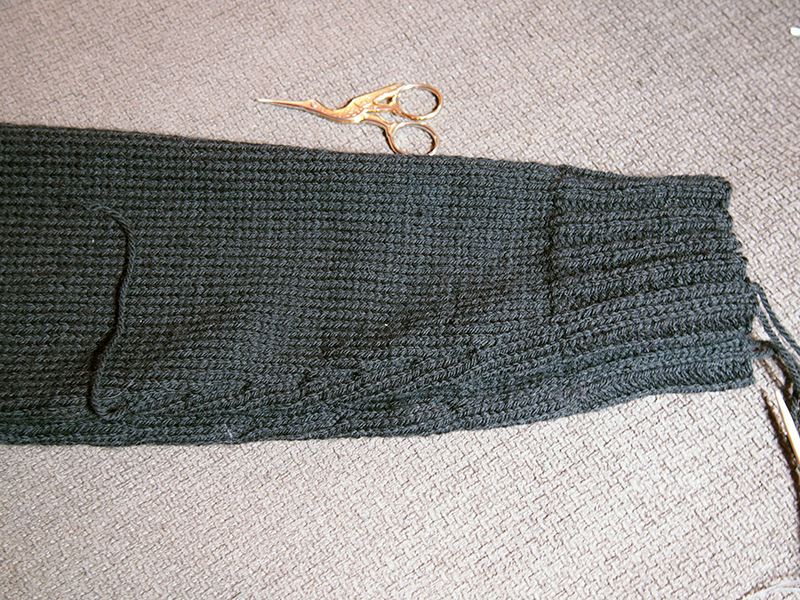 It did in that I got a 2" ease out of it (39" finished underarm), but really the cardigan is too big for me. The body is fine, giving some ease to wear over something bulky -- but the shoulders are clearly too wide. See that blip when I raise my shoulder? Oh well, I guess that's what CustomFit is for, lesson learned for next time! Some notes about the pattern. 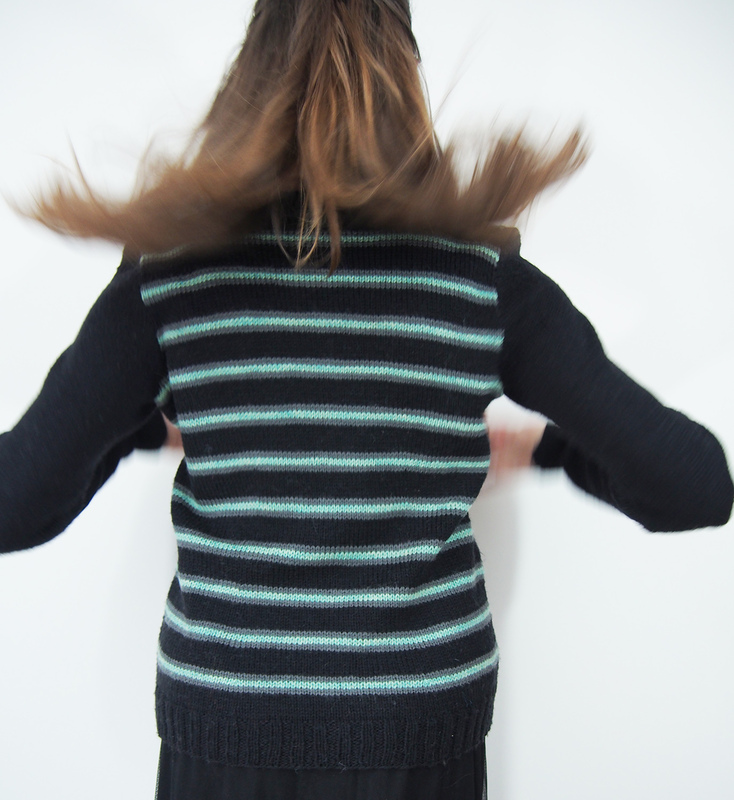 The striped cardigan was apparently only striped in the front, but the pattern didn't make that clear. DON'T WORRY if you want to stripe the back, the contrast color yarn quantities are sufficient. Also, if you want to do the striped version, I would recommend not carrying the contrast color yarns up through the main color. It makes the seams too bulky and some of those colors could show through. I'll blame my shoulder problem on my size choice, but one thing that really didn't work out was the bottom of the sleeve. The increases started way too fast and gave me a bell at the end. AND HERE STARTS DAYANA'S CUTTING FUN. First, I used mattress stitch to take in the bottom seam to where I wanted it. 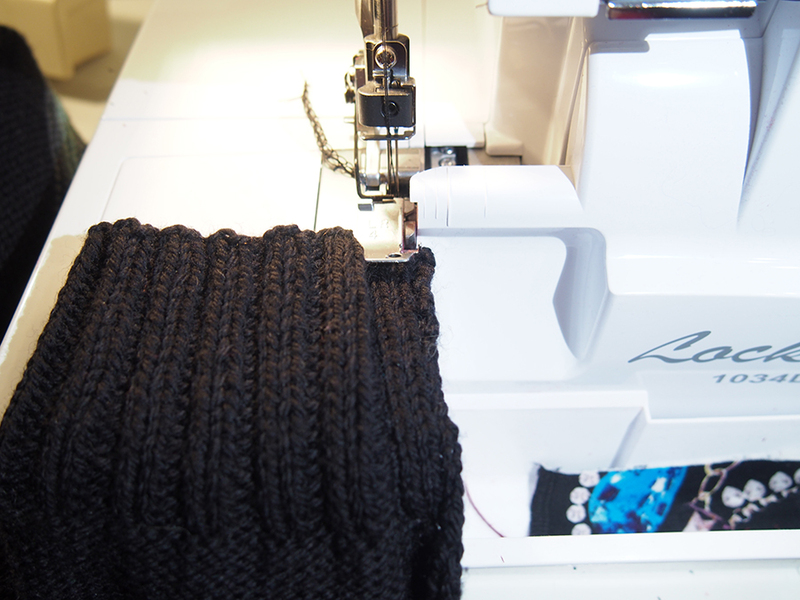 Then I used my shiny new birthday gift, a serger, to easily cut the yarn and bind the edge at the same time. HAHAHAHAHA, no. "Easily", really Dayana? That failed miserably! So out came the 80's New Home to the rescue. 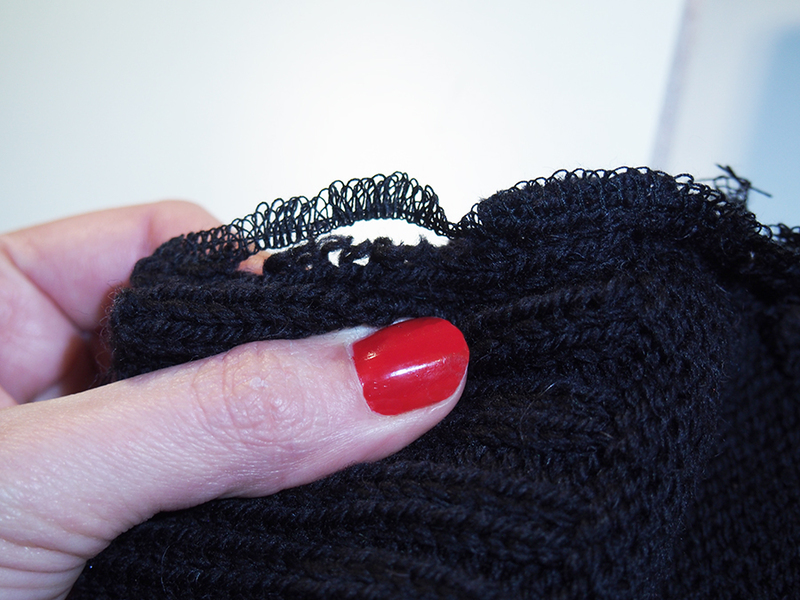 I needed to sew REALLY close to the seam now, because I had cut the yarn and it was unraveling! My moment of brilliance was to take out the zipper foot -- that allowed me to get right in there close to the mattress stitch seam. 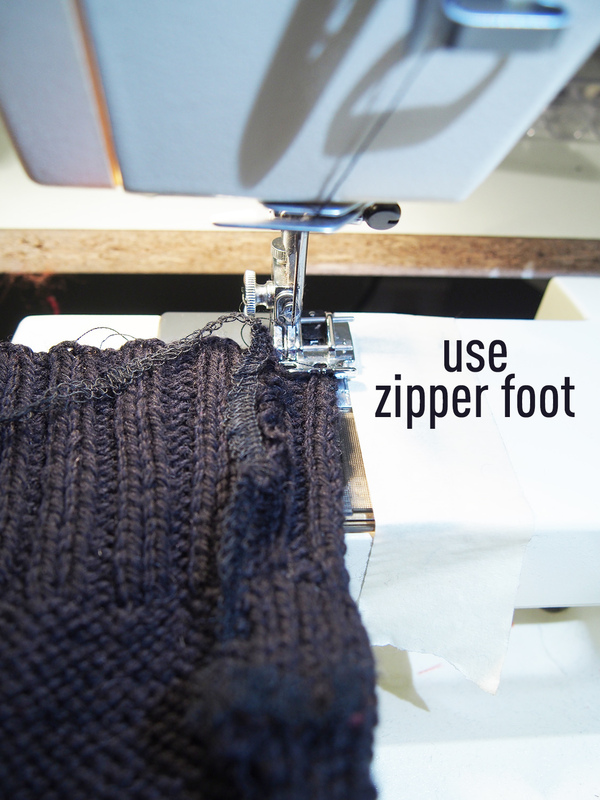 I'll be using the zipper foot for non-emergency steeks from now on. And now for some me news. The me news isn't good, though. I've got elbow tendinitis. You know, a part of me thinks that every knitting blogger has to have an injury post eventually -- but I was hoping to escape that blade. I think that my tendon is weak from crafting, but that it was the Maine Fall necessities of leaf raking and wood hauling that did me in. So, I'm off knitting for awhile. It's not the worst thing ever because oh my god! There's other stuff to do in this world, who knew! I'm actually rather proud. Maybe we all need an "injury" now and then, hey? Yeah, I've been complaining mostly on Ravelry! I'm doing physio and I have an acupuncturist in my knitting group, so I have hope. :D I also have it very large in the back -- above the waist. I wouldn't want to change to waist and below though. 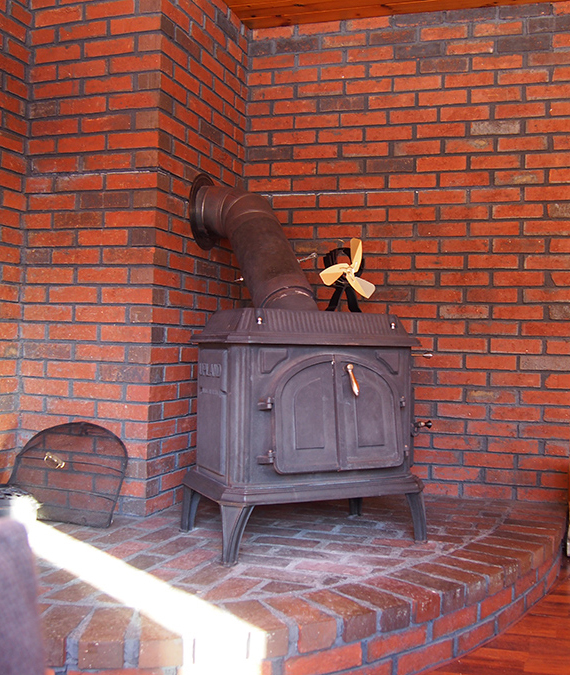 Essentially, Custom Fit is the only answer for this pattern. Thanks for the pill info, that is so good to know. Sorry about your elbow. That is not fun. Every once in a while I'll put myself on a knitting fast and only allow knitting while at school. I get a lot of housework and sewing done in the evening! This might be the time to try crochet. My first love will always be knitting. But I find crochet is less heavy and easier on the hands and arms. 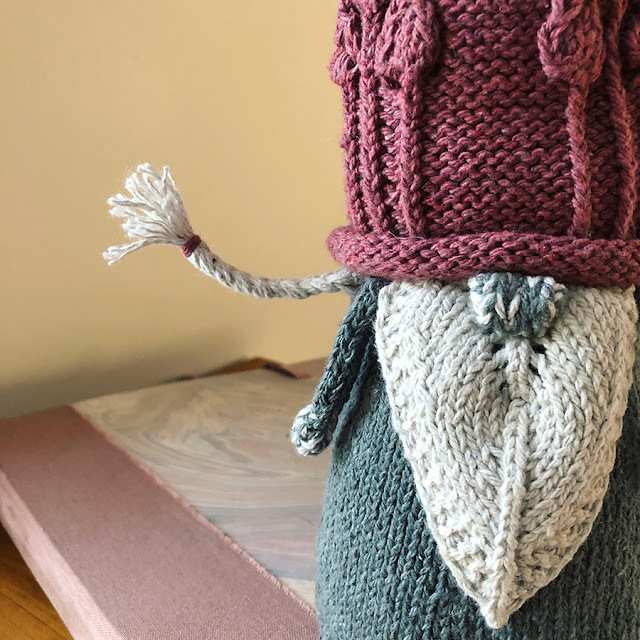 You are such a genius, I would love to see what you could crochet. It's true that it is quicker than knitting. I have tried a number of things! 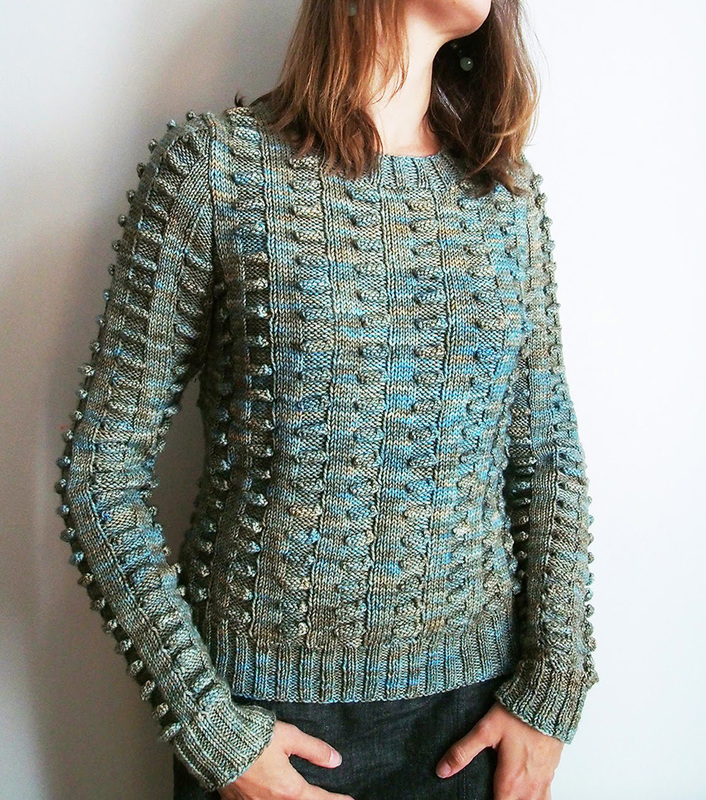 Crochet and continental knitting are definitely better, but crochet uses A LOT of motion for me. One of the problems is more that I find it VERY hard to knit for only half an hour, and taking a break after 10 minutes seems absurd! Ah sweets, get better and have fun! 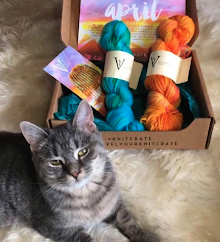 I have to say, you sound like my mom - she tells me that there's more to life than just knitting, but I am not ready to accept that just yet ;) Also, I received an online fabric store email right before your blog email, and the title is "Denim. It's not JUST for jeans!" (I'm not kidding!) I am intrigued about the sewn shirt! 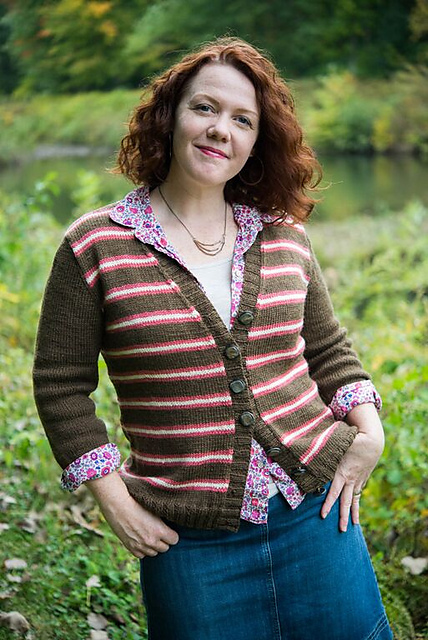 I just finished Foyle's Cardigan using CustomFit and I have to say that the sizing is large. 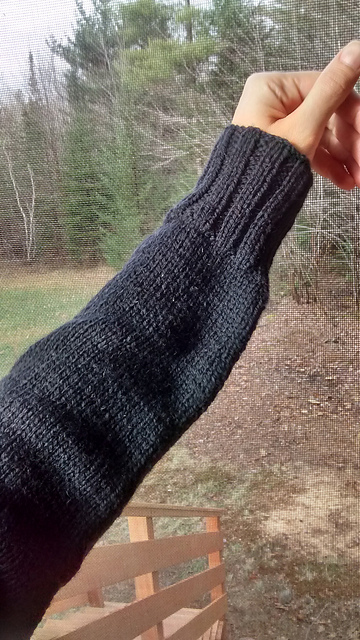 Even though I submitted my measurements and did allow for ease, the sweater is just a bit large. I especially notice it in the sleeves. Maybe I have skinny arms (and I do)! 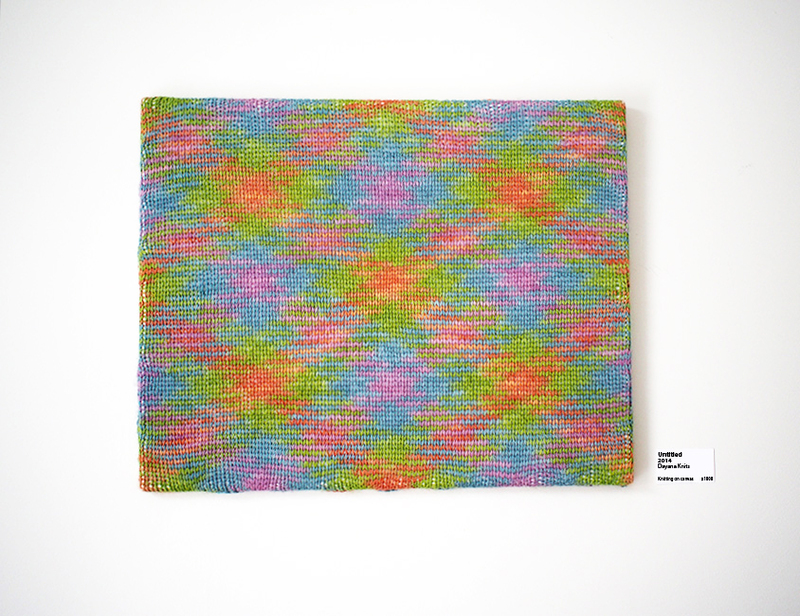 That said, Amy Herzog's pattern was really well written.